This is the last of the old pictures from the IA event at Nashville in 2011. I won't necessarily say I saved the best for last, but this definitely isn't a bad send off. I actually love this shade of green on this EG6. 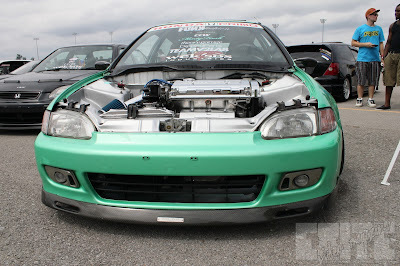 Just like the last EG6 that I showed off, this one is clean an pretty balanced. It has a little bit more camber than the other car, but not enough to make this thing purely a stance car. I think this could still get some street action. It definitely would look at home on the Osaka Kanjo, if they put a number plate on the side. I wish I had gotten a better angle of the engine bay, but I didn't. Sorry about that. It definitely looks clean in there from this angle, though.